Bathing using warm water gives such a pleasure, especially if winter arrives, or when you come home late after working in the office. Warm water seemed to be a refresher for our body. Therefore, the trend of installation of water heater in the home is becoming more popular day to day. Maybe you are one of them, demanding a water heater in your own house. Before making a decision to buy a water heater machine, you should know some water heater types, as a reference for you; you can choose the most appropriate heating devices, both in terms of economy and function. Electric Water Heater is a water heater that relies on electrical energy to generate heat. It has the same basic principles as electric irons, hair dryers and other electrical appliances that generate heat. There are two kinds of electric water heater, i.e. with tank and without tank. 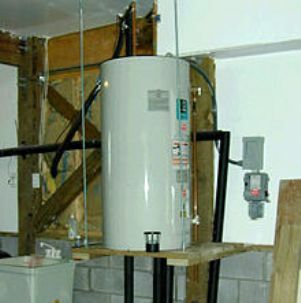 For your info, electric water heaters with a tank prices determined by the size of the tank. The larger the tank used, the more expensive they are. The other ones run without a tank. The main disadvantage of this type is that they need a large electric power, approximately 2000 watts. A water heater that relies on high Freon temperature pushed out of the compressor. The outdoor air is sucked in by the fan, and this hot air will heat the environmentally friendly refrigerant inside the evaporator, then through the compressor, the hot refrigerant is pressed so that it gets hot again. The hot refrigerant will be circulated to the heat exchanger. The heat pump heating process is very efficient because the electricity is required only for the compressor alone, so overall it will produce heating capacity up to 3 times of folding power used by heat pump. In other words, heat pump requires electric power only one third of heating capacity. To get more info about heat pump, you can visit www.huskyheatpumps.co.uk. Boiler Water Heater is a water heater that relies on solar energy, widely used for hot water needs with large capacity with a fairly hot temperature range, 80 degrees to 100 degrees Celsius. Even some types produce steam, known as steam boiler. Hot water produced is above 100 degrees Celsius and most boiler water heaters and boiler systems are used for industrial processes. They are widely used in factories that require hot water with high temperatures. Large hotels need hot water in rooms, kitchen, all of which require large amounts of hot water.